With a new school year upon us, and the change of seasons just around the corner, a new wardrobe goes hand in hand. I have alway's enjoyed shopping at The Children's Place ever since B was an infant. They have great up to date fashions, at prices that make this mommy do a happy dance! Not only are their lines both great quality and fashion forward.....have you ever been to one of their "Monster Sales"?! WOW, amazing doesn't really even acurately describe the greatness of those sales! I have walked out of The Children's Place Outlet, with a season's wardrobe (including footwear) for both of my children....for $100! The Children's Place carries fashion's and footwear for every season for Newborns through Size 14. 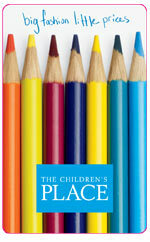 You Can find The Children's Place in your Area HERE or shop online at www.thechildrensplace.com . As the kid's head back to school, experience the great fashions and even better prices at The Children's Place! Two Lucky Reader's will each receive a $100 Gift Card for The Children's Place! Leave a comment~ which of the great new fashions from The Children's Place would you love to have for your child as they head back to school? The comment considered your entry. NOTE: You must first be a PUBLIC FOLLWER of my blog through Google Friend Connect to enter any of the Giveaway's offered on One Savvy Mom. I love the pinky bopper collection for my daughter! Is there anything that has to be done besides grabbing the Mommy Approved button? I don't want to grab it and have you wonder why! he'll climb onboard this rockin' look. our motorcyle henley is comfy, cool and perfect for your hot rod! My daughter would love to score some new jeans from the Children's Place for the fall.Thank you! I would love to have a pair of the slim cut jeans for my sons back to school and I am a GFC follower! I like the jump n jet set line. Very cute! My little man isn't heading back to school any time in the next few years, but we love the Jungle Stretchy in the baby section! I like their polos for boys! I would love to have the hoodie sweater dress for my daughter and the hoodie that say "Im the boss" for my little boy. I'd love for my daughter to get some layered tees, hooded sweater dress and graphic tees! I like the layered tees and the zip up racing hoodie for my son. I like the pink bopper baby girl outfits. I follow your blog.